Vinyl Box is limited to only 1000 copies in a deluxe hard case box set featuring an 18 page booklet with new interviews, unreleased photos from the original Enta Da Stage photo shoot and additional visual ephemera! Composed of members Buckshot, 5ft, and DJ Evil Dee, Black Moon simultaneously kicked off and defined the rap renaissance of New York with the release of Enta Da Stage in 1993. Whereas plenty of earlier groups had spit rage-filled rhymes to tear down the world’s unjust establishments, no one had evoked brooding pathos or introspective anger quite like Black Moon. Underground hip-hop might have been dominated by the sunny sound of G-Funk when Enta Da Stage dropped, but from then on the scene turned to the dark side. Black Moon was rising. Working closely with the original members, Fat Beats Records is proud to present the definitive Enta Da Stage box set. Reissued together for the first time across three formats – 6xLP boxset, 3xCD boxset, and 3xCassette boxset – this album is the complete encapsulation of an era for anyone seeking to understand the origin and the essence of New York’s Golden Age. All formats include the Da Beatminerz (Evil Dee and Mr. Walt) instrumentals and remixes, plus extensive liner notes by David Ma (Pitchfork, Wax Poetics) with rare and unreleased visual ephemera in an 18 page booklet. The story of Black Moon, alongside their peers Biggie, Big L, Nas, Kool G Rap, and Wu Tang, reminds us that the bleakest times produce the most profound agents of cultural change.And as we stand at the precipice of a new age of anxiety, Enta Da Stage has never been more relevant… or more necessary. 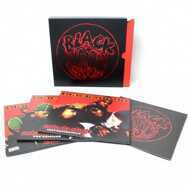 Although Black Moon would go on to release three more albums – and its members would go on to greatness with Da Beatminerz, Boot Camp Klik, and various solo projects – Enta Da Stage remains the perfect distillation of tight lyrical menace, rowdy crew hooks, stripped down breaks, and deep basslines on all of its fourteen tracks. Although Enta Da Stage might stand in the shadow of East Coast albums such as Enter the Wu-Tang (36 Chambers), Illmatic, Liquid Swords, Ready to Die, Only Built 4 Cuban Linx, and The Infamous, history will remember that Enta Da Stage preceded those releases. To understand Enta Da Stage is to understand the origin and the spirit of New York hip-hop once and for all.